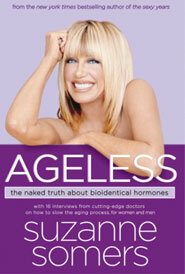 Suzanne Somers is an actress, best selling author, and celebrity spokesperson for antiaging and women’s health issues. She has taken the subject of natural hormone replacement therapy, and bio identical hormone therapy to the forefront of public attention. For an actress who became famous playing a stereotyped caricature of the unintelligent blonde on Three’s Company, she is about as unlikely a spokesperson for women’s health issues as you are going to find. However breaking stereotypes is something not unfamiliar to this dynamic 58-year-old celebrity. Suzanne Somers is a smart, business savvy, and accomplished woman in many areas, and she shows no signs of slowing down any time soon. Her own personal health challenges spurred her to write the book she titled “Ageless,” and to embrace the holistic philosophy of antiaging medicine and bio identical hormone therapy. A survivor of breast cancer she is taking the challenge of female aging head on and believes with passionate conviction that natural hormone replacement therapy can offer women very important health benefits as well as renewed confidence and well being. They have questioned the safety of bio identical hormone therapy, and claim that she is encouraging women to participate in a risky experiment, which could have serious health consequences. In fact Wyeth Pharmaceuticals initiated a “citizens petition” in a legal maneuver to stop compounding pharmacies from making bio identical hormones for their customers. How a giant pharmaceutical company qualifies as a “citizen” is another question altogether. It should also be noted that Wyeth has been sued over their synthetic estrogen replacement drug Prempro, which was alledged to cause breast cancer in women. The fact is that bio identical hormone therapy which involves hormones made from plant sources which are identical on a molecular level to the body’s natural hormones CANNOT be patented and threatens to take market share away from the major pharmaceutical companies. urging women to choose the approach of natural hormone replacement therapy, thus she is a target for attacks by the pharmaceutical industry. Is it possible to be truly ageless? Is she promising something unattainable by women and thus misleading them? I think a little common sense is in order. I don’t think anyone is claiming that aging can be entirely prevented, but it can be slowed considerably. Suzanne Somers is leading by example, and showing what is possible for women everywhere when they choose therapies based on sound holistic principles and individualized treatment. Thanks to her and her new book "ageless," more and more women are realizing that they have options such as natural hormone replacement therapy, that they were not made aware of before. It is a new age and there exists an approach that respects the individuality of the person and the necessity of formulating a treatment that fits their unique biochemistry, values and lifestyle. Women are demanding to take control over their own health and treatment options, and Suzanne Somers is showing the way by personal example.